I’ve just returned from an incredible trip to Ecuador which is surely South America’s most underrated country. Most people just think of the Galapagos when they visit Ecuador and that’s their loss as there are so many incredible places and experiences that an adventurer can seek out. I can’t think of any other country which offers such great variety of experiences and scenery and you can easily stay two to three weeks and have barely scratched the surface. Ecuador offers colonial cities and architecture, cultural interaction with local communities, exceptional and unique cuisine, and scenery which includes soaring mountains and volcanoes, cloud forests, the immense Amazon rainforest and of course the spectacular beaches and islands of the Galapagos. Hacienda Zuleta is a great option for families. Hacienda Zuleta is a beautiful colonial hacienda located in Ecuador’s highland region, approximately two hours’ drive from Quito. The property has been in the family of the late Galo Plaza Lasso – a former president of Ecuador – for more than 100 years and despite such prestige it’s hard to imagine a more homely and welcoming experience. 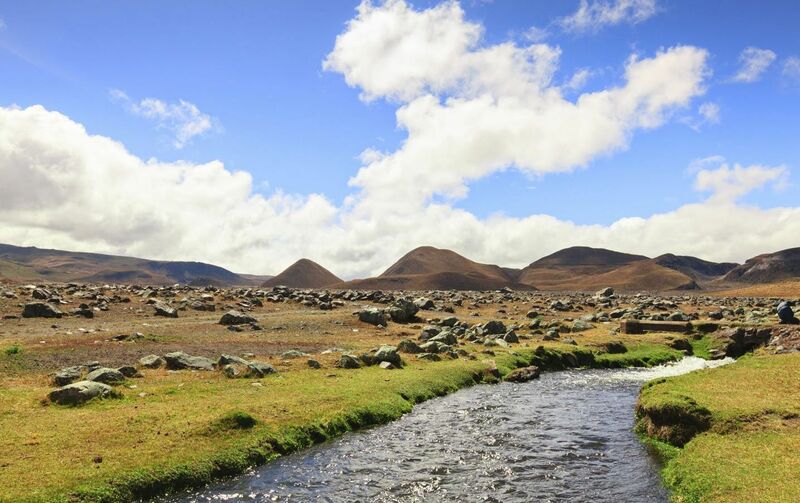 The property is located on 4,000 acres of land in a spectacularly rich, green Andean valley and is surrounded by mountain peaks and farmland. The grounds of the property are exquisite, and the hacienda has fifteen beautifully decorated bedrooms, all with their own fireplace and unique style. Delicious home cooked Ecuadorian cuisine is prepared with organic vegetables, trout and dairy products produced on the Hacienda itself, and sitting down for a meal each night with our host Fernando was an experience not to be missed with incredible food, stories and jokes aplenty. A range of activities are offered from exploring the surrounding villages, mountain biking, walking and of course going horse-riding which is excellent here; a horse to suit everyone from a beginner right through to advanced riders. They also have a condor rescue project on their grounds and you always have the chance of spotting one of the spectacled bears who call this area home. Best for: Families, couples, foodies, trekkers, horse riding enthusiasts of all levels and adventure lovers. Insider tip: It is a 1.5 to 2 hour drive to reach Zuleta from Quito which isn’t much more time than it takes to reach the Quito city centre. It is also located a short distance from Ecuador’s famous Otavalo markets, so I recommend that you consider a stopover here to gain a true Ecuadorian cultural and nature experience rather than a city break. The perfect way to begin or end your Ecuadorian adventure. 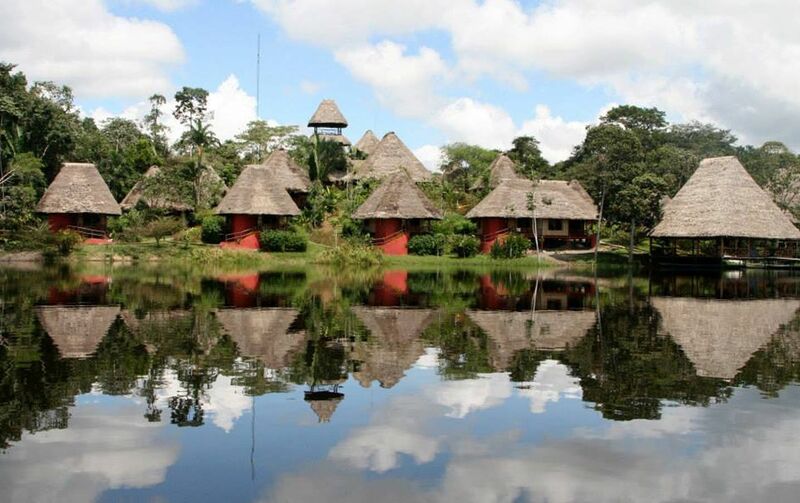 Napo Wildlife Center is the only lodge which sits within the Yasuni National Park, a region of such rich biodiversity that some scientists believe it may have more species of life than anywhere else in the world. Getting there involves a 30-minute flight to Coca followed by two hours in a speedboat where you meet your canoe and take a 90-minute tour en-route to the lodge, spotting wildlife along the way. In the dry season, in particular during February and March, this journey can involve a one-hour nature walk to the lodge. On the arrival canoe trip, we managed to spot a wide array of wildlife including sloths, capuchin monkeys, howler monkeys, squirrel monkeys, snakes and a huge variety of bird life. Finally, we reached the reflective splendour of Anangu Lake on which the lodge is located to be greeted by a huge caiman and a family of giant river otters playing around our canoe. What a welcome, and the next few days continued in such a vein of mind blowing wildlife and nature encounters; seeing everything from huge snakes and anacondas, to a huge herd of peccary (wild boar), parrots at a nearby clay lick, a huge array of colourful and rare bird life and insects, my favourite being the incredible armies of leaf cutter ants which patrol the rainforest floor. The lodge falls within the ancestral territory of the Anangu Quichua Community – the lodge opened in 2003 as a way to protect their land and provide income for the community. Everything was designed with conservation in mind and the lodge uses water from the lake in its bathrooms and reduces plastic bottle use by providing filtered water and refillable water bottles. All cabins are spacious and include a king size bed and a single bed with some larger suites now available, all constructed with local materials. In the main building there is a library, observation tower, open-air dining room and bar. Best for: Those wanting an exceptional wildlife, cultural and nature experience will not be disappointed by what I think is the best lodge in the Amazon. Amazon lodges as a whole don’t offer a luxury experience so you shouldn’t expect 5-star luxury, air conditioning or a-la-carte meals but what you can expect is that the overall experience will be exceptional. Insider tip: Travellers do not currently require malaria medication when visiting this region of the Amazon and I have to admit I was pleasantly surprised by the low numbers of mosquitoes at the lodge. According to my guide this is due to the ‘black water’ surrounding the lodge having very low pH levels which makes them unsuitable for mosquito breeding. Read my colleague Steve’s full review of the lodge here. Galapagos Safari camp is located on Santa Cruz Island, the main island of the Galapagos and offers the perfect solution for those who want a unique and luxury experience without needing to cruise. 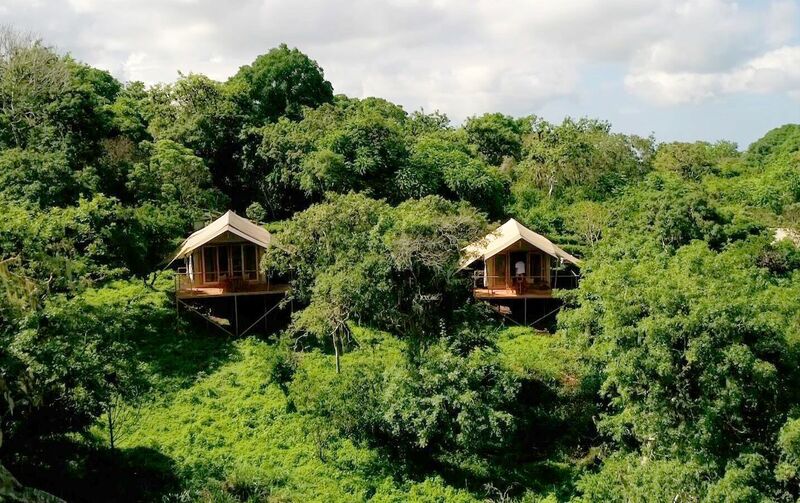 The camp is located in the highlands of Santa Cruz which is the best place in the Galapagos to see Giant Tortoises in the wild, and consists of one main lodge and nine luxury canvas safari tents all with sweeping views over the island and the Pacific Ocean. The camp makes every effort to harmonise with nature; from growing its own crops, having a farm with cows to milk and provide organic meat, a small cocoa plantation and being the only lodge in the Galapagos which is entirely self-sufficient in water due to its unique rainwater collection system. Cuisine is exceptional, and your stay includes a huge range of activities to help explore the flora and fauna of Santa Cruz Island. Mountain biking, diving, snorkelling, fishing, visits to giant sink holes and lava tunnels, kayaking and day cruises to surrounding islands where you can expect to enjoy incredible wildlife encounters at every turn. Best for: I would highly recommend a stay at Galapagos Safari Camp to anyone looking to explore the diverse wildlife and scenery of this spectacular destination, particularly those travelling with children or looking for a unique and engaging experience. It can either be considered as an alternative to the traditional cruises or as a complement to a shorter cruise which travels to areas outside of the central islands. Insider tip: Don’t miss the kayaking trip at Playa El Garrapatero, one of the most spectacular and pristine beaches I have ever seen. Expect to encounter wildlife along the way including turtles, reef sharks and Marine Iguanas. 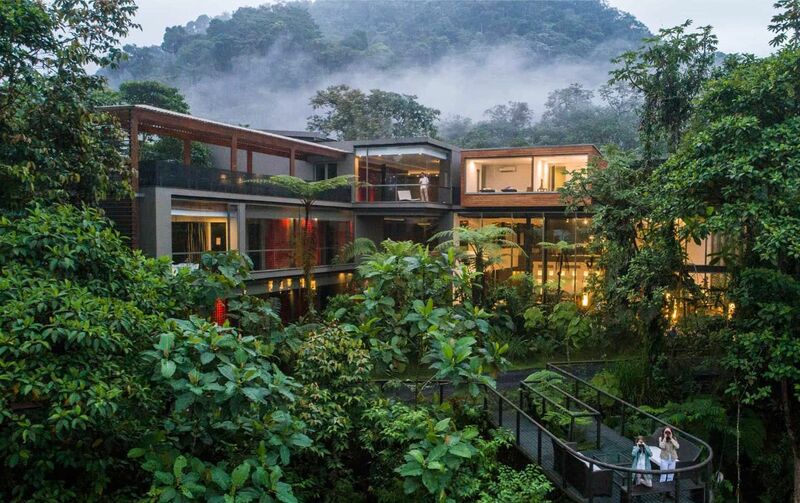 This eco-friendly lodge is neatly hidden away in one of Ecuador’s last remaining cloud forest regions which is now a private nature reserve and located just a three to four-hour drive from Quito. The last 45 minutes of the drive are particular bumpy but it’s all worthwhile when you reach what must be one of the most spectacular locations for a lodge that you could find anywhere on the planet. A member of National Geographic’s Unique Lodges of the World portfolio, the lodge itself is a beautifully designed contemporary building and your stay includes surprisingly exceptional cuisine, considering its isolated location. 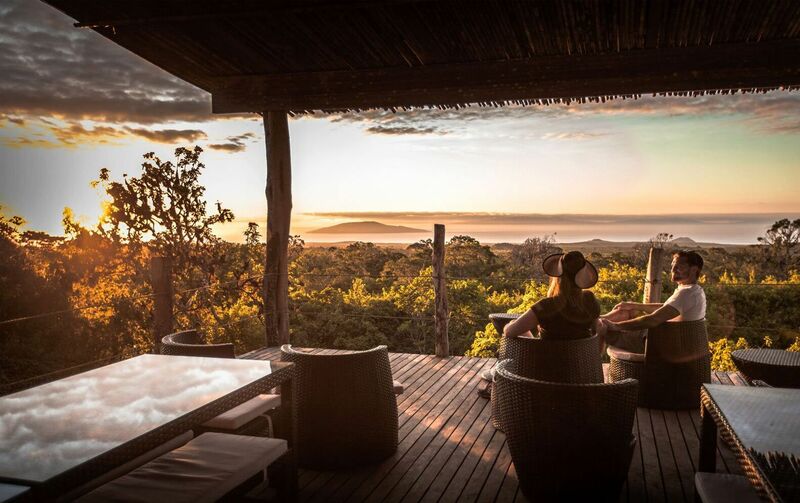 The property has 22 luxurious suites all with floor to ceiling windows facing directly into the lush forest and you will feel like you are in a glass treehouse. The Mashpi Reserve is a huge area of dramatic hills and waterfalls located in a rich cloud forest which is quite different from what you will see in the Amazon rainforest. Cloud forests are typically much cooler due to their higher altitude located at a much higher altitude and this contributes to the mist and fog which is often visible (hence the name). You can still expect humidity and this combination makes it a paradise for a huge variety of frogs which are common in Mashpi. In addition, there are a staggering 500 species of bird estimated to inhabit the forest along with monkeys, peccaries, ocelots and even pumas – although you are unlikely to see them. The naturalist guides at Mashpi are outstanding and any guest will enjoy a personalised activity program which includes several guided hikes, nocturnal animal spotting, visits to the hummingbird and butterfly sanctuaries and rides above the canopy on the unique Dragonfly cable car and Sky Bike. You can also enjoy several evening lectures by the resident biologist who will be happy to explain the ongoing conversation programs of the lodge. Best for: Adventure and conservation lovers who still desire the creature comforts and exceptional cuisine offered by a deluxe hotel. Insider tip: Don’t miss the chance for a swim in one of Mashpi’s cool streams or take the night excursion where you can expect to spot some of the most colourful frogs imaginable. 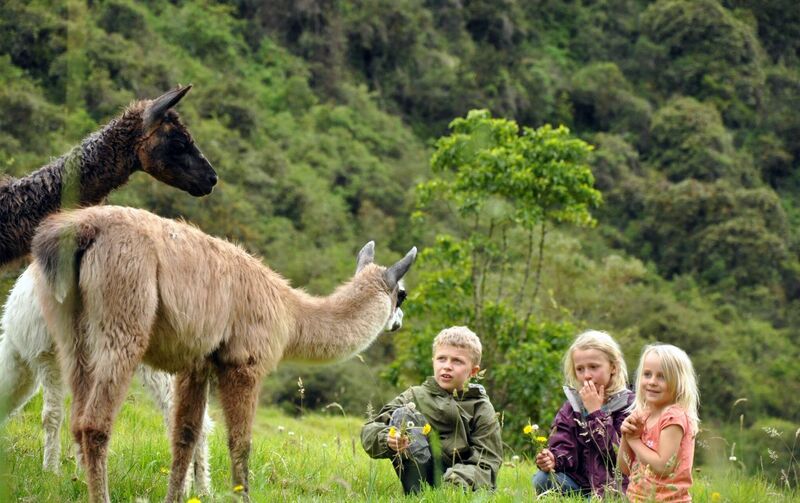 Haceinda El Porvenir is a charming family owned hacienda, located very close to the entrance of the Cotopaxi National Park which is famous for the magnificent snow-capped Cotopaxi volcano. Approximately a 1.5 to 2-hour drive from Quito, the hacienda is the homestead of a working cattle farm, and at 3,600 metres above sea level you should ensure you acclimatise with several days in Quito prior to arriving. In fact, many people use the lodge as a base for acclimatisation prior to attempting to climb Cotopaxi’s summit. Compared to some of the other lodges I have mentioned above I would describe it as ‘no frills’, you can still expect friendly service and home cooked meals but it’s very unassuming. Rooms are cosy, clean and comfortable and on a clear day the views from the property are incredible. There are a huge number of activities on offer, but the main draw-cards are either horse-riding for all levels and trekking some of the many trails. Best for: Those after a traditional highland Hacienda experience with a desire for adventure. Insider tip: request a room overlooking Cotopaxi, you never know when you might catch a glimpse of its spectacular symmetrical cone.